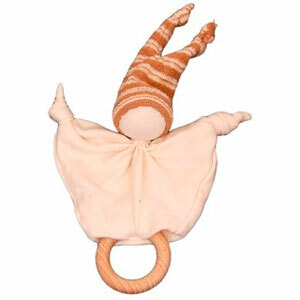 Keptin Jr’s Rattle Ring Zmooz is made with 100% organic cotton and filled with pure wool. With a gentle sounding rattle, super smooth wooden ring and 4 knots that babies just love to chew on, it makes a perfect toy for tiny hands, little mouths and inquisitive minds. Zmooz is made with "color grown cotton" which means that there are absolutely no dyes, no chemicals or any other harsh toxins, an all around naturally safe toy for your precious baby.